The arrival of the warmer spring weather makes us want to throw open our doors and windows and let the sunshine in, get the duster out and give our house a proper spring clean. It feels good to clear away the winter blues! Interestingly, the custom of ‘spring cleaning’ has its roots in various cultures through the ages. The Chinese traditionally prepare for their New Year (usually at the beginning of February) with a thorough home clean in accordance with Feng Shui principles to maximise the flow of good energy around the house. At the end of the process, paper ‘spring festival’ couplets (chunlian) are hung around doorways for good luck. The Jewish Passover celebrations in March/April coincide with the beginning of spring. According to tradition, all unleavened foods (hametz) and associated utensils must be removed from the home before Passover, both literally and a as a symbolic purification and cleansing of heart and soul. Many households take this opportunity to scrub the whole house from top to bottom. The Persian New Year (Nowruz or Norooz) falls on or around the spring equinox and is still observed by Iranians and Zoroastrians around the world. Spring cleaning (khouneh tekouni – literally ‘shaking the house’) is performed beforehand to represent renewal, and new clothes are worn on the day. Closer to home, there were practical considerations for cleaning the house at the change of the season. Before central heating and vacuum cleaners were invented, winter was a period of hunkering down indoors without much opportunity to clean coal deposits and fire grates. With the advent of spring, usually in March, it was finally warm enough to have the windows open so the dust and dirt could be swept outside. The ‘feelgood’ energy that comes from a proper spring clean may have its roots in any or all of these traditions. 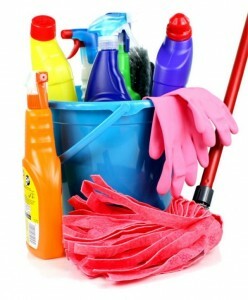 What we do know is that spring cleaning has positive effects on us that are both psychological and physical. From a health perspective, it helps to remove dust and dirt to avoid all kinds of diseases and allergies. For hygienic reasons, it’s a good idea to go to town on your sofas and upholstery, curtains, carpets and rugs in particular. Give them an annual deep clean to get rid of accumulated dust as well as nasty niffs and make your home smell fresh again. But it’s more than that – the stagnated energy of the winter gloom gives way to a new season, with spring bringing renewal and regrowth, not just in nature but in our hearts and spirit too. But simply, clearing away the debris of winter and making our homes nice and clean for spring makes us happy!